Announcements are noted as they are received and given date of start is regarded as preliminary until the start is made and this (or new date) is confirmed. See #8 rules. Should a paddler be forced to abandon, will the registration be moved and found under the heading 'Abandoned tours'. Given dates will show starting date – abandon date. We hope the tableaux to be more lucid and easy to follow. 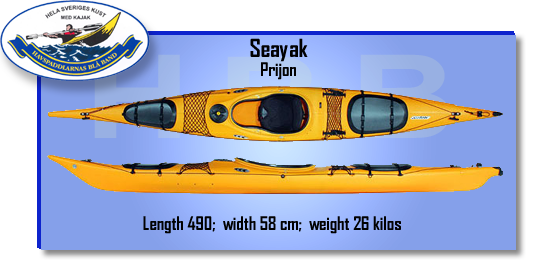 In what weather conditions are the paddlers. Find it out with this link. Among the services has SMHI foecast for Recreational time including Kustväder reachable by phone 0900-20 20 333at the charge of about 9,90 Skr/minute. The forecast is given for desired area with eventual warnings. As mentioned at their homepage the sevice covers a 5-days forecast (updated each day). SJÖFARTSRÅDET (a section of Sjöfartsverket) runs a service at no charge by phone 0771-53 54 00. This service is same as the above mentioned Kustväder and covers actual day. Also here is the desired area mentioned by a town or area. WINDFORCE can be given in different ways - here we are comparing the three most common - Beaufort, Meter/second and Knots togtether with how it might influence us paddlers. A today more common is kolometers per hour windspeed in km per tim compared to meter per sekund. For information concerning Warning for shooting with live ammunition over water at the Swedish artillery Ranges are now reachable by one link. At the page, please find, among others Ringenäs, and Kabusa, Ravlunda, Rinkaby, Revingehed och Björka. Many others are also in this list but are seldom interfering with the coastal boat traffic. http://www.forsvarsmakten.se/sv/Aktuellt/Skjutvarningar-och-avlysningar/	Please note validity time to correspond to your calculated time for desired passage. Along the west coast of Sweden one has to look out for tidal water ± 35 cm apart from the strength of the wind and direction. Information of	the cycles of tide. This brings you directly to the table for the Old Svinesund Bridge(Halden). Change the date. Note the time sliding forth each cycle with about 45 minutes per 24-hour. Its influence will gradually disappear south to the level of Skagen in Denmark as too great water (outflow of Baltic sea via Öresund) is holding it back (the outflow stream in Öresund is highest during ebb). Here it isn't about rough water as water is missing in the passage. 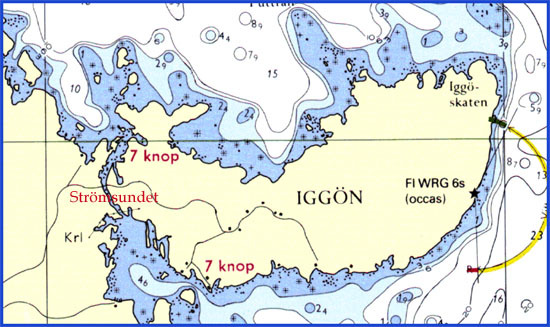 Maps and chart still show its existence at the inside of Iggön. We are many who like to choose that way, but it is only a faint memory. Looking for the inlet among the reed is a look in vain. During a short period there was a plant one liked to protect and the frequently dredging was banned. The mud soon changed the habitat and the plant disappeared. Unfortunately the passage disappeared as well and is still banned for dredging. That's why we have to do as locals — round the island at its outside with all it's shoals. 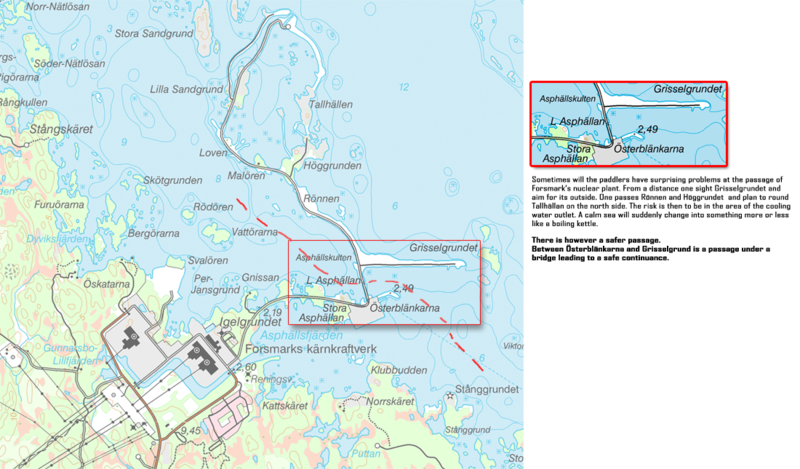 Here is part of map over Strömsundet. A lot could be told about this sound and here is som info that was found at the net.